You have stuff around your house you’re no longer using. You could turn it into money by selling it. I hear you. I’ve procrastinated on getting rid of things I haven’t used in months or years because I don’t want to go to the trouble of selling it. Maybe you’ve used eBay before. Maybe you used eBay back in the day. I’ve been selling on eBay for 17 years. A decade ago, it was a hassle, I’ll be honest. What a lot of people don’t know is just how easy it’s become to sell things on eBay. It’s practically as easy as posting on social media now. eBay autofills all of the details about the product you’re selling. You can sell right from your phone. Just snap a few pictures, and tap to select the photos you want to include from your camera roll. In fact, eBay has gone so far out of their way to make it insanely easy to sell, a lot of the advanced options are nearly impossible to find (unless you know where to look). Their idea is to get the complicated stuff out of your way so it becomes absurdly easy for anyone to sell. I’ve sold cameras, computers, and all kinds of electronics on eBay and turned it into thousands of dollars—that I then spent on new, upgraded equipment! What I’ve found is so many people either haven’t tried eBay themselves, or they did years ago and assume it’s still a hassle (it isn’t). Yet, even knowing how easy it is to sell things these days, I still procrastinate myself on offloading my unused devices. Why do we resist? Why do we put off selling stuff? 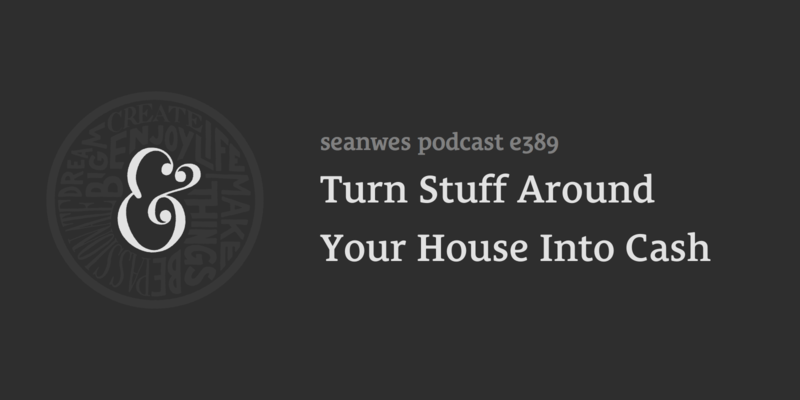 We talk about some ways you can make selling easier, practical tips for turning unused items into cash, and even flipping (buying things for cheap and selling them for more). Start by walking around your house and making a list of what to sell. Make taking inventory of what’s no longer useful a part of your regular household duties. Take photos of used items and highlight imperfections so people feel comfortable with what they’re buying. Explain why you’re selling an item and it will increase confidence in the buyer. Don’t treat your things like you’ll be the only owner. We don’t sell items for the same reason we don’t do other things: because it’s not a habit or routine. Someone will pay something for anything. People value things differently: it’s not about how much a thing is worth, it’s about how much a thing is worth to you. List brand new items with a buy-it-now option on ebay—people pay to save time.